Mitsuo Ito, on the 50cc Suzuki RM63, at the Isle Of Man. 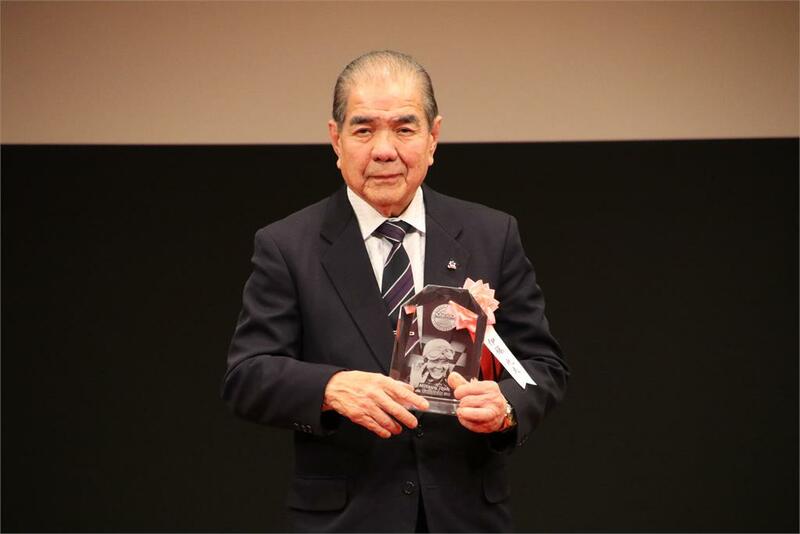 Mitsuo Ito, the first and only Japanese to win an Isle of Man TT has been inducted into the inaugural Motorcycle Federation of Japan Motor Sports Hall of Fame. 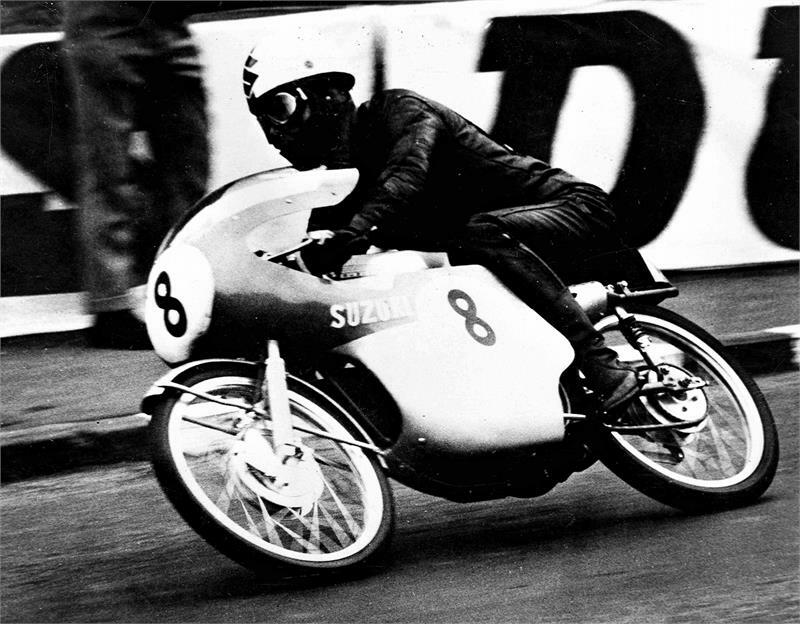 A lifetime employee of Suzuki Japan, Ito achieved this feat riding a Suzuki RM63 in the 1963 50cc Ultra-Lightweight TT. 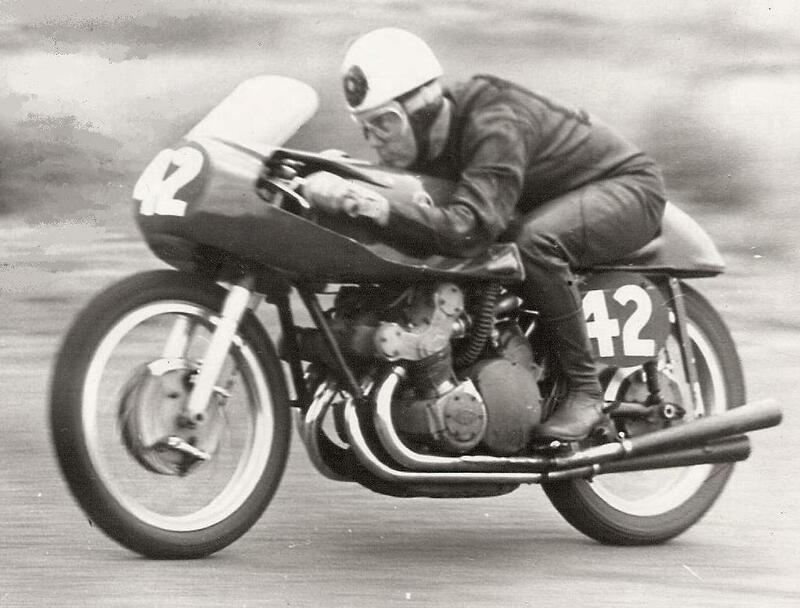 Ito participated in domestic and international Grand Prix racing from 1959 to 1967 and competed in the 50cc and 125cc categories, claiming two 50cc Grand Prix victories 13 podiums and1 fastest lap from 29 starts. In 1970 Ito also had a foray into car racing in Japan and won the only event he entered, the Japan Automobile Federation Junior Seven Challenge Cup held at Mount Fuji International Speedway driving a Suzuki Fronte RF single seater. Mitsuo also famously partnered Stirling Moss in a Suzuki 360SS for a high-speed run on the Autostrada del Sol between Milan and Naples as a publicity stunt, with the 356cc two-stroke machine averaging 122.44kph (76.08mph). After retiring from racing, Ito took part in Suzuki’s racing activities helping to develop racing machines and world-class technologies. In addition, Ito served as an engineering committee member of the MFJ for many years. He not only contributed to Suzuki but also the popularisation and development of motorcycle racing in Japan. This entry was posted in Motorcycling and tagged Grand Prix, Isle of Man TT, Mitsuo Ito, Stirling Moss, Suzuki, Suzuki 360SS, Suzuki RK67 on 22/12/2018 by Geoff Dawes. A triumphant return. Mike heading for victory in the 1978 F1 TT. It was acclaimed as one of the greatest comebacks in motor racing history. 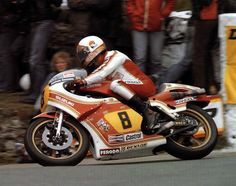 After more than a decade away from the most deadly of all motorcycle road racing circuits, the Isle of Man TT, former 9 times motorcycle World Champion, Mike Hailwood, returned to the Island riding an NCR Ducati, to win the 1978 Formula 1 TT. As if to underline he had lost none of his skill and versatility, Hailwood competed the following year again to win the Senior TT on a works Suzuki RG500 two-stroke Grand Prix racer. After his fairy-tale comeback, the 39-year-old then hung up his helmet for good. 2018 will be the fortieth anniversary of Hailwood’s remarkable return to the Island, but it was in 1977, forty years ago in Australia, that a chain of events put in motion Mike’s reunion with motorcycle racing and the TT. After limited success in car racing, a crash at the 1974 German Grand Prix ended Hailwood’s Formula One car racing career. The collision caused compound fractures of Mike’s left knee, but the right leg sustained a shattered heel, and the ankle was pushed down and compacted. It became clear that the doctors couldn’t repair his right foot even after extensive surgery and rehabilitation. Mike and his family decided to move to New Zealand where he went into a partnership with Mclaren Marine. Hailwood quickly became restless in his adopted country, and when in 1977 he was invited to be the guest of honour at a historic race meeting “over the ditch” in Australia, it was just the medicine Mike needed. 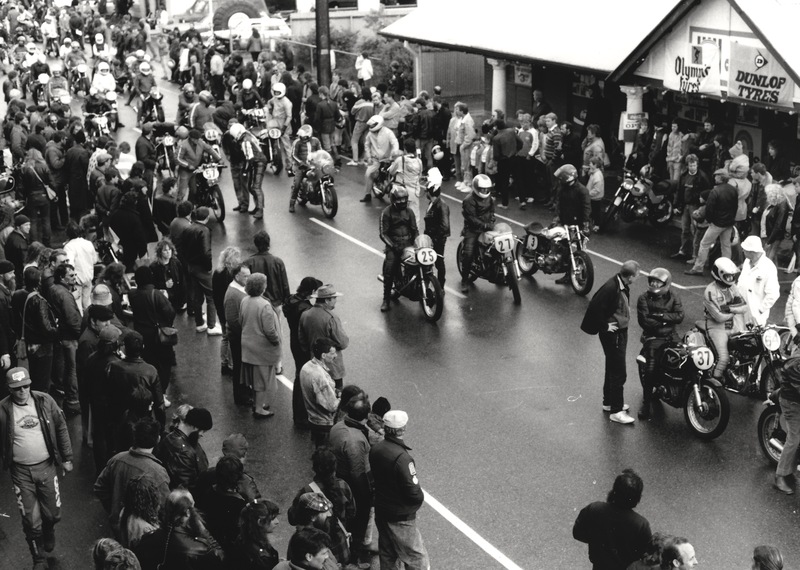 The All-Historic meeting was held at Amaroo Park in New South Wales, a circuit well known around the globe for its annual 6 Hour production motorcycle race. It was at this meeting Hailwood met and raced against Australian Jim Scaysbrook. Jim had competed successfully in dirt track, reliability trials, desert racing and speedway, and was the first Australian to race in the AMA Motocross series in 1973. The main event for motorcycles was the Keith Campbell Memorial unlimited race. Scaysbrook won the race on Alan Puckett’s 7R AJS fitted with a Seeley 630cc G50 engine with Hailwood in second place on the ex Kel Carruthers 500cc Manx Norton owned by motorcycle dealer Barry Ryan. Over the course of the Australia Day weekend, the two men became good friends. Mike was also mates with Sydney radio broadcaster, Owen Delaney, whom he had met in New Zealand. Delaney offered to sponsor Hailwood to come back for the historic race at the Easter Bathurst meeting. Mike would ride Barry Ryan’s ex-Kel Carruthers Manx Norton again and Jim the Alan Puckett 7R AJS. The event had previously been referred to as a historic machine demonstration but was officially upgraded to full race status for the 70 odd entrants. Scaysbrook won again at Mount Panorama, with Hailwood in second. 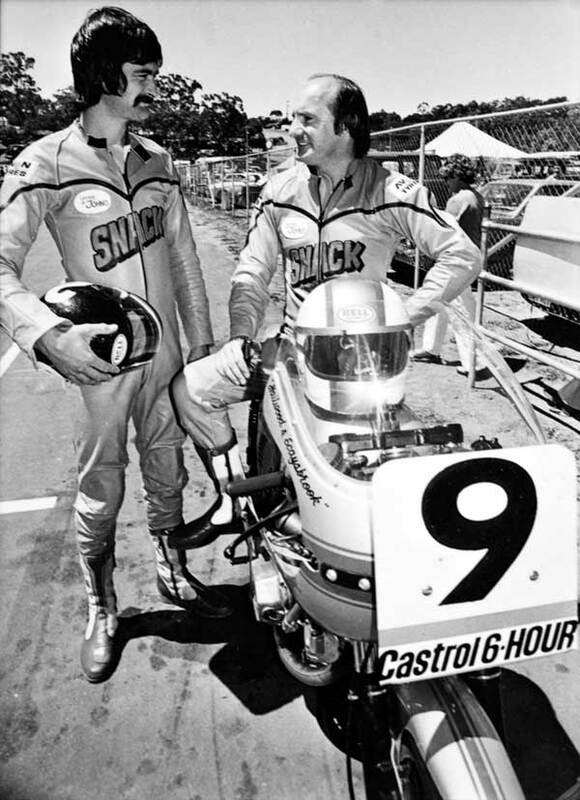 Jim Scaysbrook left, and Mike Hailwood prepare for the 1977 Castrol 6 Hour production race. Hailwood returned to Australia once more for a historic meeting at Winton to pilot Charles Edmonds Manx Norton and was enjoying racing again so much that Delaney started to put together a deal to have Hailwood and Scaysbrook team up for the October Castrol 6 Hour production endurance race. It was again a turn of events and a casual conversation that contrived to bring Hailwood back to the Isle of Man. In August 1977 a couple of months before his Castrol 6 Hour debut Mike attended the British Grand Prix at Silverstone. It was the first year the British Grand Prix was held on the mainland due to the top GP rider’s boycott of the Isle of Man TT because of the deadly nature of the street course. In the paddock at Silverstone for an F1 TT support race was Steve Wynne, owner of Sports Motorcycles in Manchester. Wynne had entered his rider, Roger Nicholls, several months earlier at the Isle of Man TT on an NCR (the unofficial factory race shop) Ducati 860cc endurance racer. Wynne was still seething over Roger Nicholls loss to Phil Read in the first-ever F1 TT, which was in effect a single race World Championship. Read, a seven-time World Champion was making a comeback to the Isle of Man and Honda Britain, wanting to cash in on the publicity, provided a special “works” endurance 820cc racer. The F1 TT race was to be held over five laps but was run in wet wintery conditions. Although Read led for most of the race, Nicholls needed only one fuel stop on the Ducati to the Honda’s two. At the halfway stage the race officials decided to shorten the five lap race to four, which Honda got wind of, but the officials did not inform the other competitors. This threw race tactics out the window and allowed Honda to dispense with the last lap fuel stop handing Read and Honda the win from Nicholls by under forty seconds. 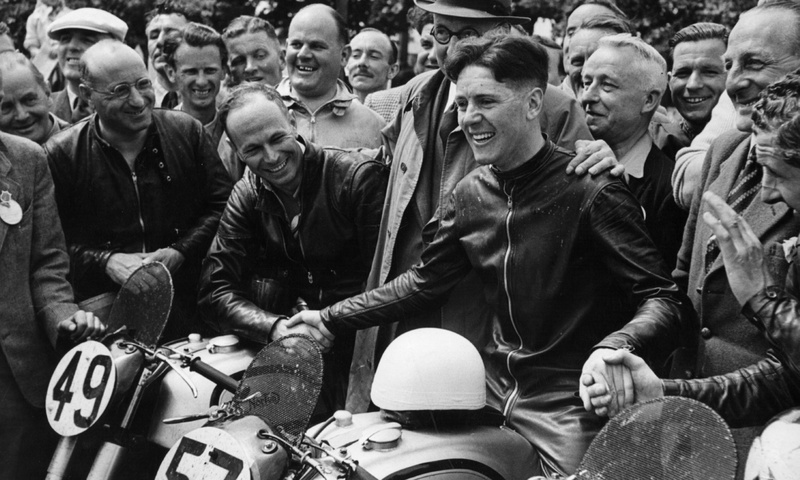 Hailwood was introduced to Wynne in the paddock, and according to Steve, it was a coming together of two upset parties. Wynne because he felt cheated out of the F1 TT title, while Hailwood had been snubbed by Honda when he’d approached them for a ride in the 1978 season. A short conversation and a handshake were all it took for the wheels to be set in motion for Hailwood’s come back to the Island on a Wynne prepared NCR Ducati. 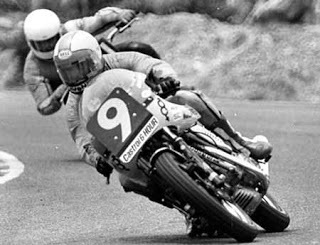 Although Mike had initially offered to ride for free under an assumed name, his longtime friend and manager, journalist Ted Mcauley, convinced Hailwood to “go public” on his comeback. A formal single page agreement was typed by Wynne to make it official, and Hailwood was to be paid the princely sum of one thousand pounds. Back in Australia preparations were also being made for Hailwood and Scaysbrook’s appointment with the Castrol 6 Hour production race. Owen Delaney, through a friend by the name of Malcolm Bailey who owned a motorcycle wrecker called Moreparts, not surprisingly, arranged the purchase of a Ducati, and Scaysbrook, through his contacts in advertising, found sponsorship in the shape of Snack Potato Chips. Unfortunately, the 1976 model Ducati 900SS purchased used a right foot gear shift, which was not ideal because of Hailwood’s injured right ankle from his Formula One car crash. The 900SS was sold and replaced with a 1977 square case 750SS, which had a left foot shift. The main weakness with the Ducati was its ground clearance around the mainly right-hand corners of Amaroo Park that caused the front header pipe to continually drag on the ground. The Moreparts team qualified well but were handicapped by the Le Mans style start because the Ducati had to be kick-started, while the competition just pushed a button. Jim and Mike though managed to pick their way through the field finishing sixth outright and second in the 750cc class. A pretty good achievement considering Hailwood insisted he would only compete in the race “just for fun”. The Moreparts team sponsors, Snack foods, had South Australia targeted next as part of a national campaign to launch their new potato chips brand, so in March 1978 the team were entered in the Adelaide 3 Hour production race at Adelaide International Raceway. This would be only Mike’s second event on the V-twin Ducati. A practice crash by Scaysbrook saw an all-nighter to rebuild the Ducati for the race using parts offered by the Ducati Owners Club from their own bikes. Hailwood on the Ducati 750ss at the 1978 Castrol 6 Hour production race. During the race, Jim and Mike almost ran out of fuel during their stints, both times somehow managing to get back to the pits. Unfortunately during the rebuild oil had only been replaced in one of the damaged fork legs, which bottomed out under heavy braking locking up the front wheel. A top ten finish in the race was quite an achievement for the duo. The Easter Bathurst meeting was next on the calendar with Jim riding the Ducati in the 750cc production class while Mike was entered on the Milledge TZ750 Yamaha in the unlimited category. Jim had arranged the ride for Hailwood after Bob Rosenthal, the bike’s usual rider, elected to miss the Bathurst meeting. It would be timely preparation for the TT as Mike had also secured, thanks to Mcauley, Martini sponsored Yamaha’s for his TT return. Bathurst was of mixed fortunes for the pair, with Scaysbrook winning the 750cc production race on the Ducati and setting a new lap record for the class, while, in atrocious weather, Mike finished 9th in the unlimited race having had to pit twice with fouling spark plugs. Now it was the TT that beckoned. Wynne had successfully secured three of the NCR 860cc Ducati endurance racers. One each for Hailwood, Nicholls and Scaysbrook but received them from the factory in the third week of April with little time to prepare for the TT, although they were able to test at Oulton Park and Donnington Park before shipping the bikes to the Isle of Man. Pat Slinn, who was the service and technical manager for the UK Ducati importer Coburn and Hughes, was also acting as a technical liaison for Sports Motorcycles with the Ducati experimental department and NCR. Pat knew first hand how much hard work Ducati had put into Hailwood’s F1 racer. Slinn, “Franco Farne’s experimental department at the Ducati factory in Bologna completely rebuilt the F1 rolling chassis after it was initially built by NCR, this was because they wanted everything to be absolutely spot on. Mike’s engines were built by (senior engine technician) Guiliano Pedretti, where I saw one engine being built and I watched it being power tested.” Pedretti prepared three engines for Mike’s F1 TT machine one of which was earmarked for the race and produced more power than the other two. Farne and Pedretti were then sent by Ducati to the TT to look after and prepare Hailwood’s bike for the F1 race. Mike also had the Martini sponsored Yamaha’s at his disposal. Known as Team Hailwood Martini, Mike had a production TZ 250 for the Junior TT, an ex-Agostini OW20 for the 500cc Senior TT and a production TZ750 for the 1000cc Classic TT. Turning the spanners for the Martini Team were Mike’s former mechanic Nobby Clark and respected technician Trevor Tilbury. The first event of the TT meeting was the F1 race which was increased to six laps that year. The crowds of spectators had swollen thanks to Hailwood’s comeback, although there was some trepidation in the minds of the fans. Could Hailwood still do it? What if he got hurt or even worse? The spectators knew Mike was putting the substance of legend on the line. And it wasn’t just Read riding a factory Honda, TT regular and a winner of two 1000cc Classic TT’s John Williams was on a second factory Honda, while Tom Herron, Tony Rutter and Helmut Dahne were on works supported dealer entries. Read led the 63 competitors away for the six-lap 226.38 mile (364.32km) race. But all eyes were on the number 12 Ducati starting from the fifth row (Mcauley had requested the number 12 from the A.C.U. as it represented the number of Hailwood’s TT victories). The grandstand crowd rose and applauded as Mike set off in pursuit of Read. From a standing start, he logged a new lap record of 109.87mph (176.8kph) taking 90 seconds of Read’s existing record. Hailwood, who was ahead on time, chipped away at Read’s lead until they were on the road together going over the Mountain. Hailwood was 100 metres ahead as they came down the Mountain and headed for a fuel stop. They pitted together with Read getting away first and Hailwood in close pursuit. Soon Mike was on Read’s wheel tracks pushing the Honda along. Blue smoke started to appear from the Honda’s exhaust on the down changes and with 64 miles (103km) to go the Honda expired, and Read’s race was run. To the roar of the crowd, Hailwood took the checkered flag and another TT victory. On his way to the token TT F1 World Championship, Hailwood had also set a new lap record of 110.627mph (178.037kph) for the class. Read later admitted he had over-revved the Honda to try and stay ahead of Hailwood, but unbeknown to Mike when he shut the Ducati’s throttle before crossing the line a bevel gear failed. A couple of hundred metres earlier and it would have been John Williams on the other factory Honda that could have won the race. It was a fairytale come true for Hailwood, Wynne, and the Ducati factory. Hailwood hunts down Read in the 1978 F1 TT. Unfortunately, the other three TT races Team Hailwood Martini had entered weren’t to be so successful. In the Senior TT, a steering damper on the OW20 TZ500cc Yamaha broke causing Hailwood to stop at Ramsay to try and effect repairs before returning to the pits and putting himself out of contention. In the Junior TT Mike finished in 12th place on the production TZ250 and in the 1000cc Classic TT, a faulty crankshaft failed on the TZ750 ending his race. Such is the fickleness of the TT. Mike had agreed to do some TT F1 races in England, as part of the MR TOPPS/ACU TT F1 British Championship series and the British Grand Prix TT F1 support race. Post TT was Mallory Park a tight short circuit not suited to the Ducati. Showing skill and patience, Mike eventually romped home to victory beating again many of his TT rivals and in Wynne’s opinion a more significant triumph than the TT win. Donnington Park was next, but Hailwood crashed out of the race while in the lead, although he set an identical lap record to the eventual winner Roger Marshall on a Honda. At the British Grand Prix TT F1 support race, the Ducati was out powered on Silverstone’s high-speed straights. With new sponsorship from Australian clothing manufacturer Golden Breed, the now outclassed Ducati 750cc SS was entered in the October 1978 Castrol 6 Hour production race. Teamed once again with Jim Scaysbrook things didn’t start well when Mike crashed during Thursday practice. A rebuild was required, and once more it was local Ducati owners that helped out with spare parts. A new rule that year required a nominated reserve rider. Stu Avant was the rider, and he was obliged to practice on the Ducati. Unfortunately, Stu crashed the bike again, which necessitated another rebuild. On Saturday during qualifying, Mike put in one lap, and the engine blew a big end bearing. Another rebuild, but by race day they still hadn’t qualified to compete in the race, but the officials wisely decided to turn a blind eye and allowed them to start. Mike did the first stint and was practically last away at the Le Man’s start because of his injured ankle and having to kick-start the Ducati. Hailwood had them into the lead of the 750cc class when he handed over to Scaysbrook. Ten laps later, after such a promising start, the Ducati slid out from underneath Jim in The Loop, and their race was over. This wasn’t the end of Mike’s production racing adventures in Australia though. He teamed with Scaysbrook again for the Adelaide 3 Hour in early 1979 on Jim’s own Honda CB900FZ. But fate was against them once more; a loose number plate had the duo black-flagged, but they managed to resume the race after repairs had been made and finished a creditable 10th place. 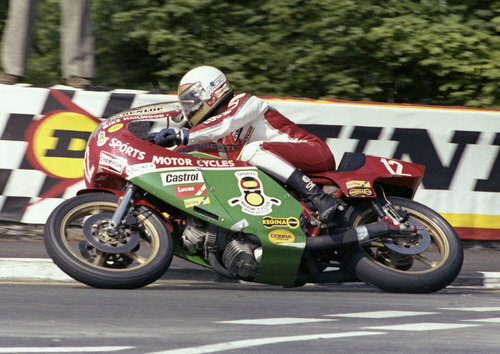 However, Mike was not done with the Isle of Man TT yet and entered again in 1979 on a Sports Motorcycle supplied factory NCR Ducati’s in both the TT F1 race and the 1000cc Classic TT. He was also entered in the 500cc Senior TT on a Suzuki GB RG500. But the alarm bells started ringing for the Sports Motorcycles team at a test session and press conference at Misano in Italy for the NCR Endurance Racing Team. Mike’s TT F1 machine was unprepared and sported a gear-shift the reverse of what Ducati knew Hailwood required. The problem was Ducati’s ongoing financial situation, which was controlled by an Italian Government holding body EFIM who would only supply a budget for the Endurance Team. Mike went out and tested the cobbled together machine only to select a false neutral and instinctively hit second gear instead of fourth. The resulting high side crash gave Hailwood three broken ribs and a badly bruised arm only two months out from the TT. In the meantime, a financial compromise was found with Ducati to pay for the racers by invoicing the British importer Coburn and Hughes who would then invoice Sports Motorcycles for the machines. Hailwood on his way to victory during the 1978 F1 TT. During practice for the F1 TT, it became clearly apparent that the NCR Ducati handled woefully. It no longer used the Daspa frame of the 1978 machine, and the FIM had tightened the TT F1 regulations, which now required the use of production crankcases instead of the special sand cast ones of the previous year. Hailwood also told the team the engine was less potent than the ’78 unit. Something needed to be done. The Sports Motorcycles team decided to send for Roger Nicholls 1978 TT F1 Ducati racer, which was masquerading as Hailwoods TTF1 winning bike on display in the Luton showroom of the Ducati importer Coburn and Hughes. The idea was to transplant the 1979 engine into the 1978 chassis. The bike arrived midday Thursday of practice week, and the engine was installed into the frame, but there were problems with fitting the exhaust system of the ‘78 bike plus numerous ancillary parts that needed new brackets made. Finding enough steel in the early hours of the morning was a problem, but fortunately, a supply was found at the back of the workshop which was the generator room of the Palace Hotel where old furniture was stored, including some steel bed frames. After a mammoth effort, Hailwood had something that represented a competitive motorcycle to defend his and Ducati’s title on. It was aptly nicknamed the “Bedstead Special” by MCN journalist Peter Howdle who knew how much work had gone into preparing Mike’s bike. It has gone down history that Hailwood finished fifth in Saturday’s F1 TT, although he had somehow managed to claw his way up to third on the recalcitrant Ducati at the halfway mark. On the final lap of six, plunging down Bray Hill, Mike lost fifth gear. The over-revving engine then cut out. Hailwood stopped at Hillberry to find vibration had broken the bracket holding the battery, which came adrift disconnecting the wires. Mike reattached the battery, shoved it back into the bike to limp home fifth. But Hailwood’s big moment was to come in Monday’s Senior TT. Riding a Suzuki RG500, he became only the third man to lap the Island in under 20 minutes on his way to victory setting a new lap record of 19m 51.2s at an average speed of 114.02mph (183.497kmh). It was a victory that confirmed what everybody knew, Hailwood was still master of the Island. In preference to the NCR Ducati that was supplied for Friday’s 1000cc Classic TT, Hailwood decided to use the Suzuki RG500. It became a race that many would compare to the epic battle between Mike and “Ago” in the 1967 500cc TT. His main opponent was Glaswegian Alex George aboard the “works” 998cc Honda, and it would become a two horse race with the other riders becoming extras as the drama played out. Mike’s Suzuki had been rebuilt overnight after a minor fault was discovered, but it was George who led by 9.2 seconds after lap one of the six-lap race. Hailwood closed the gap to 4 seconds on the next. After posting identical lap times at the halfway stage, it was Honda works team efficiency and the advantage of a quick filler that sorted out the pit stops. It was also the first time at midpoint a TT had taken under an hour. 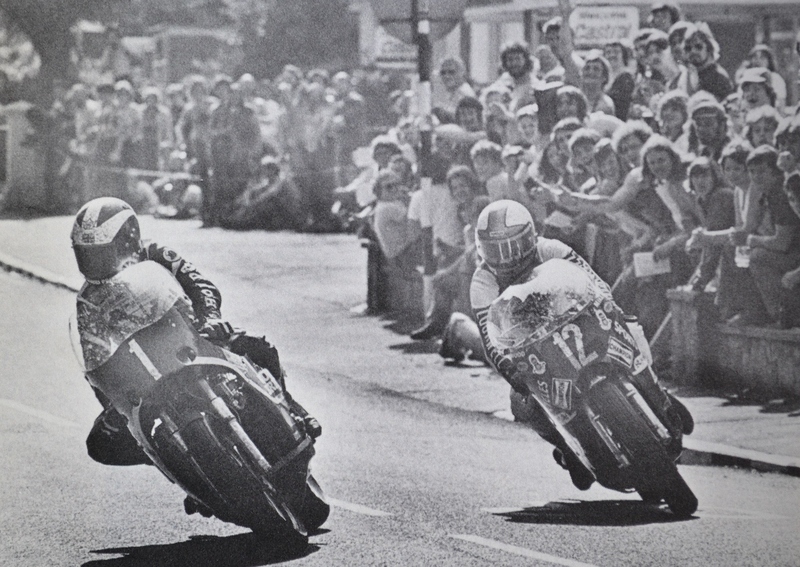 George led by 4.2 seconds, but by lap 5 Hailwood had taken the lead by a mere four-fifths of a second and still held an advantage on the last lap at Ballacraine, but at Ramsey, he was behind again. George had come back from behind and maintained his lead to take the win by just 3.4 seconds. Hailwood had announced that it would be his last TT and although he did so without achieving another victory, the fans were not disappointed. Mike on the Suzuki RG500 during the 1979 Senior TT. Hailwood was pencilled in once more to take in the post TT races at Mallory Park, which was part of the Forward Trust/MCW TT Formula 1 Championship but decided to look for more competitive machinery than the NCR Ducati. A Paul Dunstall Suzuki was his choice, but brake issues saw Mike withdraw from the running. Donnington Park was the next round and Mike’s last race. A crash in practice saw him heading for the hospital with a broken collarbone. After having pins inserted he checked himself out against Doctors orders on race day and returned to the track to be driven around the circuit to say goodbye to the thousands of fans who had come to see him. By then Hailwood had moved back to England and had opened a motorcycle dealership in Birmingham with friend and former 250cc World Champion Rod Gould. Only two years later in 1981, the sad epitaph to this colossus of motorcycle racing was written. A tragic road accident claimed Mike and his 9-year-old daughter Michelle’s lives. His son, 7-year-old David, was also in the car but survived with minor injuries. In 1968 Hailwood was awarded an M.B.E. in the Queens Honours List for his services to motorcycling, and he also was awarded the Seagrave Trophy in 1979 in recognition of his two TT wins in 1978 and 1979. Mike became a Federation Internationale de Motocyclisme “official legend” in 2000 and was inducted into the American Motorcycle Association Hall of Fame that same year. 2001 saw Mike’s induction into the International Motorsports Hall of Fame. Hailwood had also been awarded the George Medal for bravery after pulling Clay Regazonni from his burning F1 car at the 1973 South African Formula One Grand Prix. During a Grand Prix career that spanned 10 years from 1958 to 1967, Hailwood won 76 Grand Prix and claimed 112 podiums from 152 starts. He was World Champion 9 times scoring three 250cc World Championships, two 350cc World Championships and four 500cc World Championships. He was also the first rider to win four consecutive 500cc World Championships. 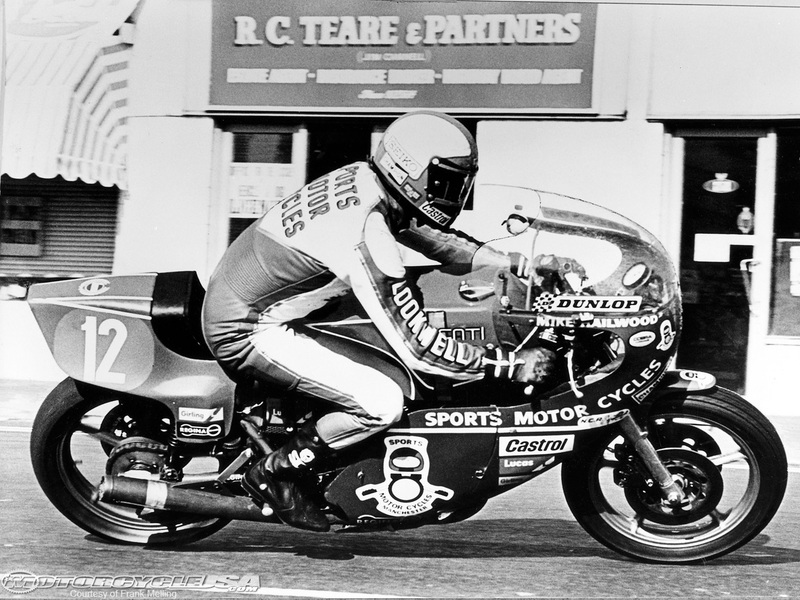 Mike won a total of 14 Isle of Man TT’s before retiring permanently from the sport. “Mike the bike” M.B.E. G.M. ; to many the greatest motorcycle racer of all time. Words © Geoff Dawes 2017. Images courtesy of http://www.ducati.com http://www.motorycleclassics.com, http://www.pinterest.com,www.rezbikes.com, http://www.roadtrackanddriver.blogspot.com.au. Videos courtesy Youtube and Vimeo. 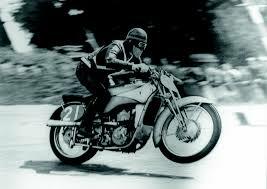 This entry was posted in Motorcycle Racing, Motorcycling and tagged 1000cc Classic TT, 820cc Honda Endurance Racer, Alex George, F1 TT, Isle of Man TT, Mike Hailwood, Mike Hailwood Replica, NCR Ducati, Phil Read, Rod Gould, Senior TT, Sports Motorcycles, Steve Wynne on 17/08/2017 by Geoff Dawes. I’ve published this article from February 2014 again as I recently found an excellent documentary on the Lobethal races by Tony Parkinson produced in 2008. Tony has been kind enough to allow me to embed the video at the bottom of the page. Many thanks, Tony. Brought to the Island by Audi Heritage to celebrate its historic victory in 1938, it was a recreation of the machine that Ewald Kluge used to become the first German, and only the second foreigner, to win a TT. DKW was the largest manufacturer of motorcycles in the world during the 1930’s with a research and development department that boasted 150 employees. DKW also produced cars and in 1932 merged with three other German car manufacturers Audi, Horch and Wanderer to become part of Auto Union, which was represented by the four linked circle insignia that the Audi brand still uses today. There is no doubt about the Nazi influence on the German Automotive industry prior to the Second World War. Hitler bankrolled the racing efforts of the Silver Arrows, supporting Mercedes and Auto Unions dominance of Grand Prix motor racing. It was all part of Hitler’s plan to show the world the technological superiority of Nazi Germany. The Nazi’s had infiltrated most aspects of German life and in 1932 set up the N.S.K.K. or the Nationalist Socialist Drivers Corps which “Nazified” the driving associations and clubs. It made it almost impossible for the national racing heroes of the era not to be associated with the Nazi’s. The team had planned to return again at the end of 1938 and Kluge left behind his practice bike. This was a 1936 model works URe 250, which was left in the care of the Victorian DKW importer who was waiting for the arrival of a 1938 SS 250 production version of the factory machines. DKW was the first manufacturer to sell a production version of their “works” racers to the public. However, the team did not return due to the onset of the Second World War. Kluge was called up for military service in 1940 and was captured by the Russians and not released until 1949 due to his association with the Nazi’s. At the age of 44, he returned to competition but suffered a serious high-speed accident at the 1953 Eifelrennen at the Nurburgring, which ended his career. 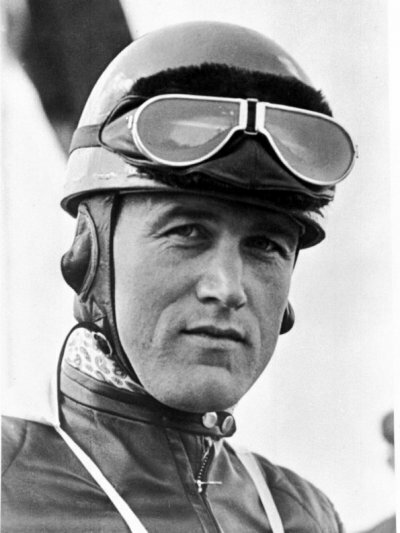 Ewald Kluge was only 55 years old when he passed away in 1964, leaving a remarkable racing legacy. After the war road races were held at nearby Woodside and in 1948 racing returned once more to Lobethal until the South Australian State Government banned racing on public roads and brought to an end any thoughts of resurrecting the Lobethal TT. It would no doubt be reassuring to Kluge, that Audi Tradition continues to honour his racing achievements and that of the DKW works team. 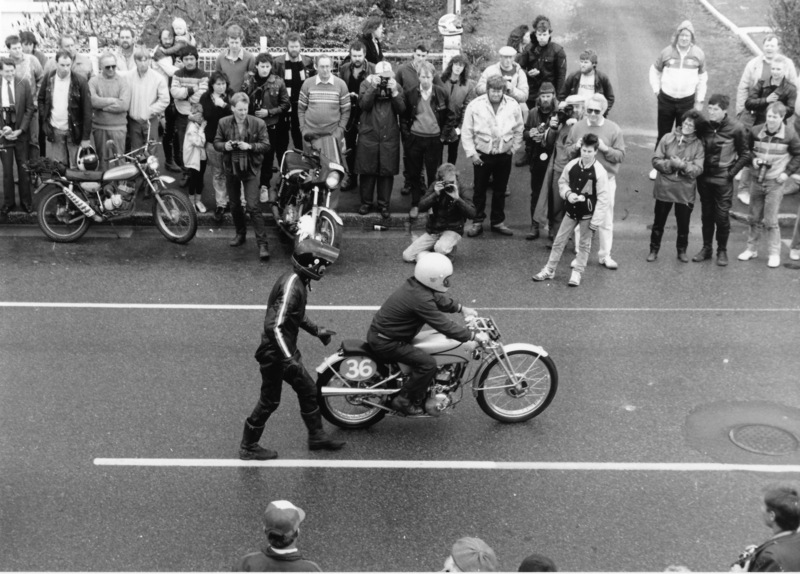 And although the roads around Lobethal are no longer used as a racing circuit, motorcyclist from all over Adelaide ride the course regularly to enjoy what was once one of the worlds great road racing circuits. This entry was posted in Motorcycle Racing and tagged Audi Tradition, Australian TT, DKW SS 250, DKW URe 250, Ewald Kluge, Isle of Man TT, Lobethal TT, Nazi Germany, Silver Arrows on 23/08/2015 by Geoff Dawes. Vale Geoffrey Ernest Duke, 29th of March 1923 to the 1st of May 2015. In this modern world of instant access to 24-hour news services and an almost inescapable saturation of the latest events from around the globe, it’s not unusual for those in the public eye to quickly achieve the status of celebrity or even “Superstar”. But to accomplish this level of fame during the 1950’s, in what could only be described at that time as a minority sport, is truly extraordinary. Born in St. Helens, Lancashire on the 29th of March 1923, Geoff Duke OBE became a household name during this period in Britain, Europe and the Commonwealth. A four times World Champion in the 500cc (MotoGP) class and twice in the 350cc category of Grand Prix motorcycle racing, Duke also became the first rider to win three consecutive 500cc (MotoGP) World Championships between1953 and1955. 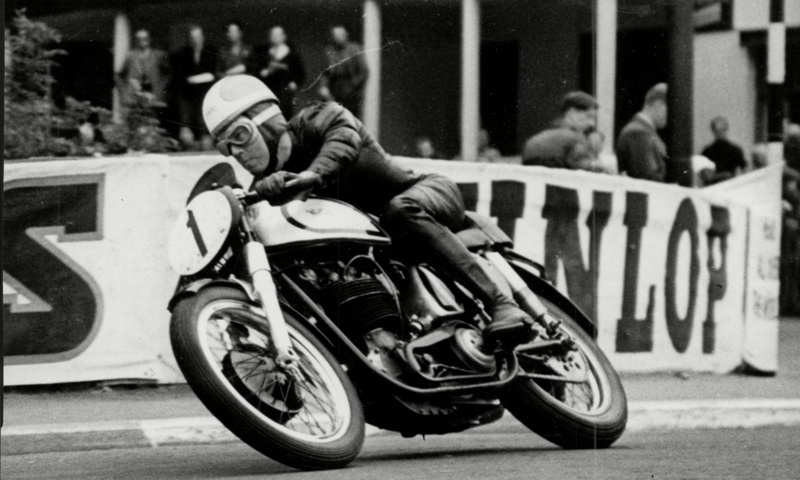 Geoff would have been in contention for a fourth title had the FIM not imposed a six-month ban for supporting a privateers strike for more start money at the 1955 Dutch TT. Duke also became the first rider to win two World Championships in the same year, taking the 350cc and 500cc titles in 1951. Duke on the Norton single. Duke’s background in motorcycling had started at the age of 10, when unbeknown to his parents he bought a belt drive Raleigh of the same vintage. While still a teenager at the start of the Second World War, Duke trained dispatch riders in the Royal Signals Corps. He subsequently competed for the first time in military trials events and also achieved the status of Team Sergeant in the Royal Signals Motorcycle Team, the famous “White Helmets”. An exceptional trials rider, Duke was employed in Norton’s trials department after the war. However, he already had his sights set on something faster. With Norton’s backing, he made his road-racing debut in 1948, starting out on the most dangerous racetrack of them all, the Isle of Man TT course. Duke on the technically advanced Gilera. His initial World Championship titles in 1951 had come on Norton singles but a reluctance by Norton management to pay Duke what he was worth led him to change to the technically advanced, but unruly, Italian four-cylinder Gilera. 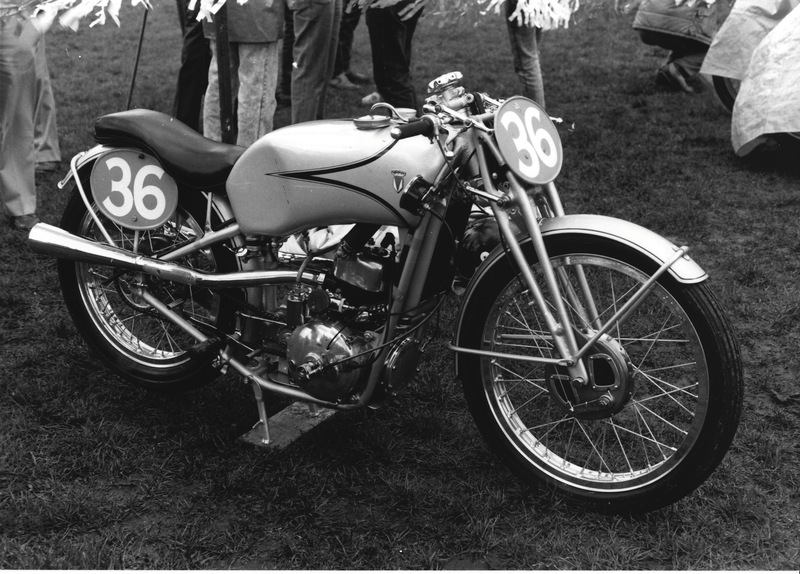 Duke helped develop the advanced machines to take a hat-trick of 500cc titles. He also became the first rider to win 500cc world titles on two different brands of motorcycles, a feat that has only been emulated by a handful of riders. Geoff also set new standards off the motorcycle, with a polite manner, good looks and smart clothes. Another first for Duke was the use of a close-fitting one-piece leather racing suit, which no doubt came about by trying to reduce wind resistance on the underpowered Norton singles. Duke also dabbled in car racing and became an Aston Martin “works driver” during in 1952 and 1953. After 33 Grand Prix wins from 89 starts and 50 podiums, which included 6 wins at the Isle of Man TT, Duke retired from GP motorcycle racing, ending an illustrious 10-year road racing career. A short-lived and unsuccessful return to car racing resulted in a major crash in Sweden after which Geoff became a Hotelier in the Isle of Man, which by then was his home. As well as receiving an Order of the British Empire in 1953, Duke was voted BBC Sportsman of the year and awarded the prestigious RAC Seagrave Trophy, both in 1951. Duke passed away at his home on the Isle Of Man on the 1st of May 2015. He was 92 years old. Words Geoff Dawes © 2015. Images courtesy http://www.theguardian.com, http://www.members.boardhost.com. Video courtesy http://www.dukevideo.com. This entry was posted in Motorcycle Racing, Motorcycling and tagged Aston Martin, Geoff Duke, gilera, Isle of Man TT, Manx Norton, Motorcycle World Championship on 28/05/2015 by Geoff Dawes. 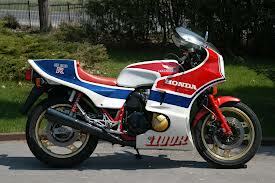 The fully faired 1982 CB1100RC Honda. It ‘s an understatement to suggest that racing success helped build the very foundations of the Honda Motor Company. It was the driving force to win, instilled by corporation founder Soichiro Honda that the company’s engineering capabilities be proven in the white heat of competition. The forays, starting in 1959 to the Isle of Man TT, to take on the best in the world in Grand Prix racing, proved pivotal to the success of the fledgeling motorcycle manufacturer. But in 1970’s production racing, and in particular the prestigious Australian Castrol Six Hour production race, this philosophy was faltering. In a class of racing that pitted showroom floor models against each other under racing conditions, Honda had tasted success but once, in the 1971 event, with the venerable CB750. The unfaired CB1100RB explicitly built for the 1980 Australian Castrol Six Hour race. The Castrol Six-Hour had become the jewel in the crown of endurance production racing that enjoyed live television coverage in Australia and immense media exposure all over the world. It was a class of racing with a huge following as it allowed motorcycle owners to see how “their” bike performed against machines from the other manufacturers. And in an era of unprecedented motorcycle sales, the old adage, “what wins on Sunday sells on Monday”, had never been more true. Honda held great hope for success in 1979 with the RCB endurance racer inspired CB900FZ, but it was unable to be fully competitive against its larger capacity rivals from Suzuki and Yamaha. Although claiming a creditable third place the previous year, Honda’s own CBX1000 six-cylinder flagship did not have the success that Honda desired. And the war for production racing supremacy was not just being waged in Australia, but also South Africa, New Zealand and the U.K which was also a part of Honda’s dilemma. This required contemplation and a new approach to the race, or rather, the regulations. 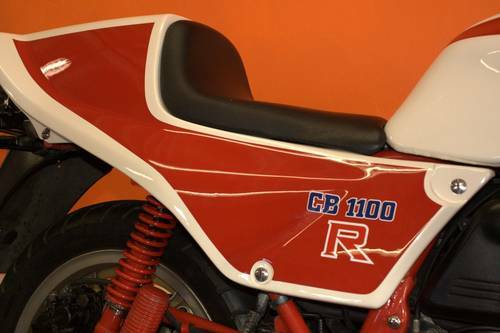 The CB1100R series of motorcycles was created out of production racing necessity. Honda became the first Japanese manufacturer to build a production homologation special for the road, manufacturing enough road-registerable models to stay within the rules. In a clever bit of reverse engineering Honda looked to its CB900FZ road bike, which had been based on the highly successful RCB1000 endurance racer. It used lessons learnt from the RCB to transform the CB900F into a specialist endurance production racer. There was some irony here as Honda was also developing in parallel the RSC1000, by necessity based on the CB900F, to meet the regulations for the new prototype World Endurance Championship of 1980. Honda Australia rider Dennis Neil was recruited by Honda Japan to develop the new machine and was responsible for testing it in both Australia and Japan. One hundred of the CB1100RB were fast-tracked and registered by Honda to make the September cut off deadline for entry into the 1980 Castrol Six Hour. 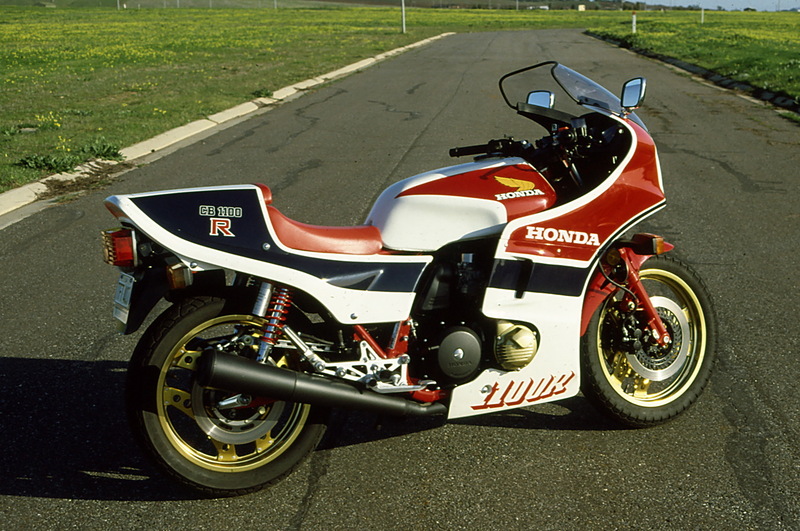 This was an unfaired version of the bike, which was unique to the R series. European models and those released in most other markets were fitted with a half fairing. The faired version of the CB1100RB sold in South Africa the UK and New Zealand. The evolution of the CB900F to transform it into the CB1100R, though, was quite extensive. 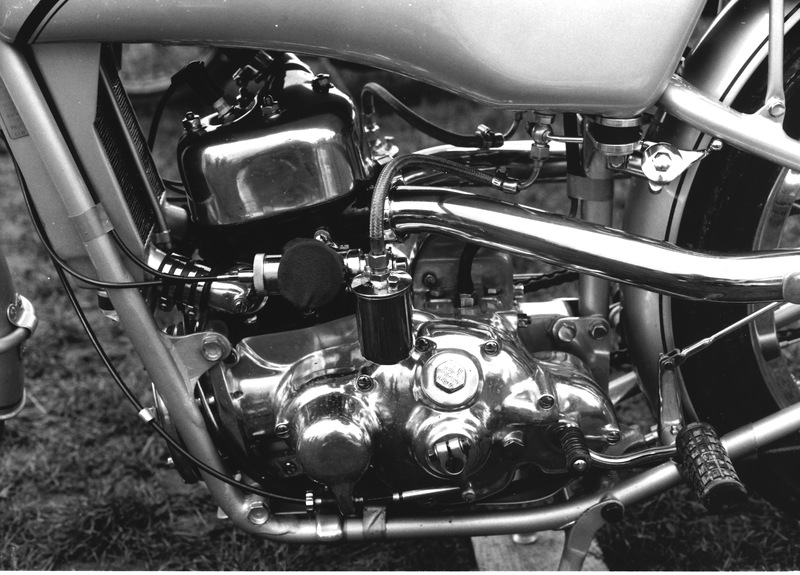 Although the engine shared the same 69mm stroke of the CB900F, the bore was increased from 64.5mm to 70mm to give an engine capacity of 1062cc, the same as variants of both the RCB and RSC endurance racers. The cylinder block was solid, doing away with the air gap between the two outer and two inside cylinders. The compression ratio was increased, up from 8.8:1 to 10:1, and many of the engine internals were beefed up, including a wider primary drive chain, strengthened clutch, conrods, big end bearings and gudgeon pins while the pistons became semi-forged items and the camshafts had sportier profiles. The standard gearbox was retained, although final overall gearing was raised by ten percent, and carburation also remained the same as the CB900F using four constant velocity Keihin VB 32mm units. 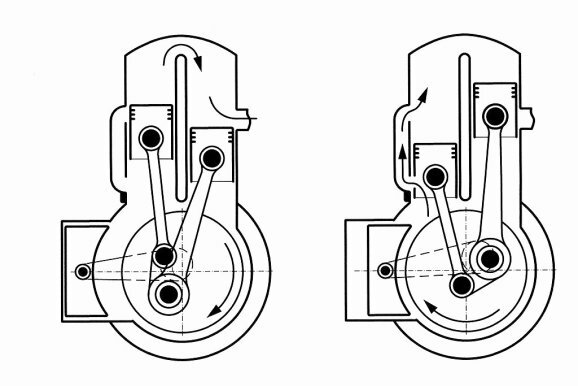 This resulted in CB1100RB producing 115hp (85kw) at 9000rpm and 72ft.lb (98N-m) of torque at 7,500rpm, compared to 95hp (69.8kw) at 9000rpm and 57ft.lb (77.4N-m) at 8000rpm of the CB900FZ. The chassis was strengthened with extra gusseting and the detachable lower frame rail of the CB900F, designed for ease of engine removal, now became a solid part of the frame. The front engine mounts were also heavy-duty alloy items, which no doubt all helped to improve the rigidity of the chassis. The 35mm CB900F front forks were replaced with new 38mm units that used air assistance to adjust the spring rate via a linked hose from each fork and the rear shock absorbers carried a finned piggyback reservoir to help cool the damping oil. 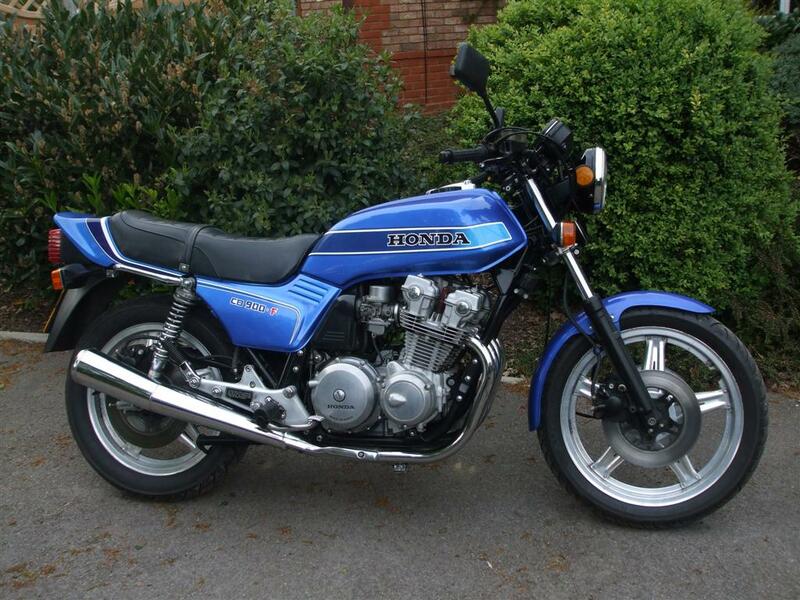 Honda reverse Comstar wheels were fitted although the diameters remained the same as the CB900F, with an 18inch rear wheel and a 19inch front. But the rim widths were wider, up from 2.15 inches for both the front and rear of CB900F to a 2.75 inch rear and a 2.5 inch front for the CB1100RB. This was to accommodate the new generation tyres developed for the race due to the intense competition between tyre manufacturers. Honda also introduced for the first time their dual twin-piston floating calipers that gripped solid 296mm disks. A single fibreglass seat unit that also housed the toolkit took the place of the CB900F’s dual seat. The fuel capacity was increased from 20 litres to 26 litres with a massive alloy fuel tank. The instruments and switchgear were taken straight off the CB900F, but the duralumin handlebars were changed to multi-adjustable items that could be replaced quickly in the event of a crash. The exhaust system was visually similar to the CB900F, being a four into two, but on the CB1100RB it was freer flowing and utilised a balance pipe just ahead of the two mufflers. It was also finished in matt black as opposed to chrome and was well tucked in. The pulse generator and ignition cover on either end of the crankshaft were reduced in size and chamfered to also help improve ground clearance. The foot pegs were rear-set and raised slightly on new lighter alloy castings. Honda was quite proud of achieving a fifty-degree angle of lean for the RB without anything touching down. This was extremely important at such a tight circuit as Amaroo Park where the Castrol Six Hour was held. Single seat unit of the RB housed the toolkit. However, the Willoughby District Motorcycle Club did not welcome the appearance of the CB1100RB at the 1980 Castrol Six Hour. The organisers of the event argued that the CB100RB did not conform to the rules for a touring motorcycle, as it had no provision to carry a pillion passenger. Honda quite rightly pointed out that this was not written into the supplementary regulations for the event and indeed the organisers had to yield. It should also be pointed out that the organisers had turned a blind eye in previous years to entries such as the 750 and 900 SS Ducati’s that also could not carry a pillion passenger. It’s history now that Wayne Gardner and Andrew Johnson on the privately entered Mentor Motorcycles CB1100RB won the race, held in wet conditions, ahead of the Honda Australia entry of Dennis Neil and Roger Heyes. But it was a controversial win and not the clear-cut victory Honda would have hoped for. Suzuki Australia claimed that a lap scoring error had taken the win away from John Pace and Neil Chivas on a GSX1100. After three appeals the Suzuki team were eventually awarded the win, only for Mentor Motorcycles to appeal against the ruling and be reinstated just four weeks before the 1981 race. To top all this off, the WDMC released the supplementary regulations for the race, which specifically banned solo seats. Honda turned its back on the 1981 race and once again studied the rules. Some solace was sought when the CB1100RB won all of the eight 1981 MCN Streetbike series in the UK, with seven victories going to series winner Ron Haslam. The end result of all of the above culminated in the 1982 CB1100RC, which came equipped with a dual seat and rear footpegs – and also a full fairing. A removable cover was used to give the appearance of a single seat, while the tools were moved to a lockable toolbox that was hung off the seat subframe just behind the left rear shock absorber. The rear suspension units were now inverted reservoir gas charged FVQ units with four-way compression damping and three-way adjustable extension damping with five spring preloads. Front fork diameter was increased from 38mm to 39mm with separate air adjustment on the top of each fork leg. The forks also boasted a new innovation from Honda, Torque Reactive Anti-dive Control or TRAC. This was a mechanical four-way adjustable system that utilised the pivoting torque of the brake calipers to close a valve in the fork leg, under braking, to increase compression damping which limited front end nose-dive. The front brake disks now became ventilated while 18-inch “boomerang” spoked Comstar wheels graced both ends of the RC. The rear rim width was now 3.0 inches, up from 2.75 on the RB, while the front rim width remained 2.5 inches but on an 18 instead of 19-inch wheel. Steering rake was increased by half a degree to 28 degrees and trail was shortened from 121mm to 113mm mainly to accommodate the effects of the new 18-inch front wheel. The wheelbase also became slightly longer from 1488mm of the RB to 1490mm for the RC but still 25mm shorter than the CB900F. The instrument “pod” now was now mounted in the nose of the full fairing, and the tachometer became electronic as opposed to the cable driven item of the RB. There was also the inclusion of an oil temperature gauge mounted with the warning lights on the top steering yoke. The full fairing was lightweight fibreglass, reinforced with carbon fibre, and its lower half was quickly removable utilising six Dzus type fasteners and two screws. In the engine department, the only significant mechanical change was a stronger cam chain tensioner and 1mm larger Keihin VB 33mm CV carburettors. Claimed horsepower and torque remained the same as the CB1100RB, although South African and New Zealand models were recorded as giving 120hp. Honda dominated the 1982 Castrol Six Hour even though Suzuki unleashed its 1100 Katana with special wider wire wheels. Wayne Gardner and Wayne Clarke took the top place on the podium with three other CB1100RC’s finishing behind them. The nearest Suzuki Katana was a lap down in fifth. Honda again dominated the British MCN Streetbike series winning all the races with Ron Haslam and Wayne Gardner sharing the spoils and series title. For 1983 new restrictions were put in place for production racing, which limited engine capacity to 1000cc and effectively made the CB1100RC redundant. The Honda CB1100RD. Note the nose of the fairing in line with front axle line. Honda still produced one more model in the series, the 1983 CB1100RD, the main differences from the RC being a rectangular tube swingarm, which was slightly wider for the new fatter tyres, and it also carried upgraded rear shock absorbers. The nose of the fairing was also pulled back to be in line with the front axle to meet racing regulations. Aesthetically the blue stripe ran up the sides of the headlight and not underneath it while the blue and red paintwork appeared almost metallic in its finish. The Honda winged transfer on the tank was grey, black and white as opposed to yellow and white of the RB and RC. The overall finish of the RD appeared a notch above the RB and RC, and it was suggested that Honda did not have the capacity on its production line to cope with the limited number run required to homologate these two models. Honda’s Racing Services Centre (which became the Honda Racing Corporation in 1982) was said to have been responsible for assembling both the RB and RC. 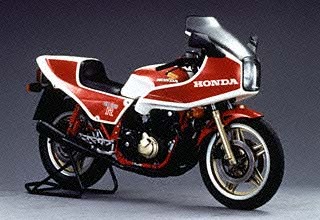 An upgraded production line in 1983 enabled Honda to accommodate the RD. This does make sense and a good reason for the better quality of finish of the RD. It also makes the RB and RC somewhat unique as they would have been assembled by Honda’s racing department. 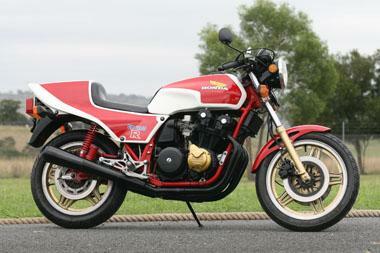 How limited in numbers was the CB1100R series? 1,050 of the 1981 RB were reported to have been built, although whether this figure includes the 100 fast -racked unfaired machines for the 1980 Castrol Six Hour is unclear. It seems that 1,500 of both the RC and RD were made, giving a number of 4,050 in total. Words Geoff Dawes © 2013. Photograph Geoff Dawes (C)1982. Images http://www.nirvanamotorcycles.com, http://www.mctrader.com.au, http://www.worldhonda.com, http://www.carandclassic.co.uk, http://www.flkr.com. This entry was posted in Motorcycle Racing, Motorcycling and tagged Amaroo Park, Australia, Castrol Six-Hour, Honda, Honda CB100RB, Honda CB1100RC, Honda CB1100RD, Isle of Man TT, New Zealand, Ron Haslam, Wayne Gardner on 31/12/2013 by Geoff Dawes.